Last year we were delighted to receive a small collection of items relating to artist John Leech from Maureen Lambourne. Included in the collection was a copy of John Leech: His Life and Works by artist W. P. Frith (1891). On closer inspection this book had a hidden history. Now largely forgotten, John Leech (29 August 1817 – 29 October 1864) was in his time highly regarded by both the public and his contemporaries in art and literature. He was best known as a caricaturist and illustrator for Punch Magazine. There were two main strands to John Leech's work- the everyday life of Victorian Britain and sport. As such he is an important Sporting Chronicler and illustrator. He was also the first illustrator of Charles Dickens A Christmas Carol. William Powell Frith (1819-1909) the author and friend of Leech was a Victorian genre painter best known for his large scale depictions of everyday life such as Derby Day and Ramsgate Sands. As a close Friend of Leech, Frith took it on himself to write the first Biography of Leech, published in 1891. The book on its own was considered an excellent addition to BSAT library. However on closer inspection, glued to the flyleaf was a letter from WP Frith to M H Speilmann. 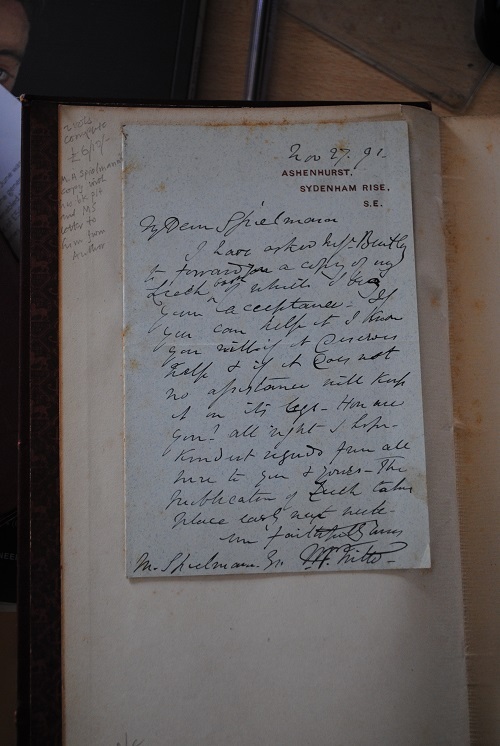 The letter gifted the book to M H Speilmann and was dated Nov 27 1891, a week before its publication. The book also contains Spielmann’s personal book plate. Speilmann was a prolific Victorian art critic and scholar. He was the editor of The Connoisseur and Magazine of Art. He wrote a history of Punch, the first biography of John Everett Millais and a detailed investigation into the evidence for portraits of William Shakespeare. The letter is clearly an authors’ letter to a critic politely asking for him to consider reviewing the book. This small object connects three important figures of the Victorian Art World and gives a small insight into Victorian Artistic Circles. I have asked Mr Bentley to forward a copy of my Leech book which I beg your acceptance. If you can help it I know you will if it deserves help and if it does not no assistance will help it on its legs. How are you? Alright I hope. Kindest regards from all here to you and yours. The publication of the Leech takes place early next week.